When conditions are perfect, so is the Eureka Backcountry 1. When the weather falls apart, so does the tent. On the other hand the Backcountry 1 does have its share of advantages, principally it is both lightweight and comfortable, and for the minimalist that's probably enough. On the other hand the Backcountry 1 isn't strong on weatherproofing, Eureka's "Storm Shield" partial rain fly simply isn't a sufficient defense against big storms, shifting winds, and horizontal rain. The tent isn't weatherproof but it won't turn into an indoor lake either and thanks to aluminum poles the walls will stay stiff even against high winds. Basically the Backcountry 1 is simple with no frills, it's weather resistant enough, light enough, comfortable enough, and probably most importantly cheap enough to be a value for most solo backpackers. The lack of a vestibule to store muddy boots or dirty backpacks is a tough give-away but keep down the weight (and cost) Eureka had to cut corners somewhere. Fortunately the tent does breathe well, meaning unless the elements are throwing everything they have at the Backcountry 1 it should be cozy. The headroom and elbow room is plenty for a single occupant and almost luxurious compared to other solo shelters. When set up properly my Zephyer (older Backcountry model) preforms in all weather conditions the NE has to throw at it. I've weathered high wind n driving rain. The only problem I ever had with it is having to replace it after 15 good years of service. Can you say that about any other tent you ever owned? Thanks for the comment! it's nice to have a differing opinion people can reference against. I know this is an old thread but I figured I'd throw in my 2 cents anyway.. From what I can tell, the picture of this tent featured is actually a super old Eureka Mountain Pass 2 (circa 1996). I know because I have (and still use) one. 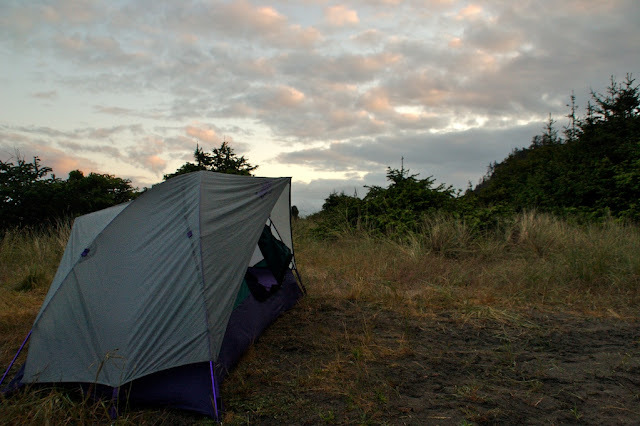 That particular model provides exactly what the author describes: a good balance between weight, cost, weather proofing, and ventilation in a backpacking tent. Important to note though, this will make a heavy (albeit roomy) one person tent or a rather tight two person tent (read: if either of the two people are over ~5'8", you'll have issues). Eureka still makes a fairly affordable version of the Mountain Pass while correcting some of the above mentioned deficiencies (ie. improved waterproofing, dimensions and the now seemingly essential vestibule). The cost in weight however makes the Mountain Pass prohibitively heavy for most backpackers. This tent seems to fall into the category of "minimalist car camper" that still enjoys the occasional back-country trip. The alternative is what Eureka now calls the Backcountry style. This style is basically the same as the above picture but with a little more room (someone 6' feet will likely be alright) and a less dated color scheme. Still no vestibule and the weather proofing is more or less the same as it was in the 90's but now offered in a 1, 2, & 3 person version. From what I can tell, the tent is made exclusively for Campmor: a long time retailer for the east coast camper. Having used this tent hard for more then a decade, I can say without a doubt it's worth the money. It's done a tour duty up and down the appalachian and is now sufficiently serving in Utah. Thumbs up if you're looking for an all around balance in modern tent buying.